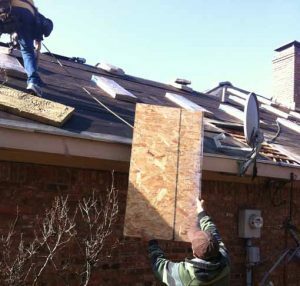 At Texas Star Roofing, we want you to be an informed consumer when it comes to the types of roof you have installed, down to the roofing repair we are going to perform. If you’re new to roofing terminology (most are!) and need to look a few roofing terms up to help verbalize the issues you’ve been having, this is a great page to do that. Below you’ll find common roofing terminology to help you understand our industry a little more. Of course we’re always here to listen to any questions or concerns you have about your new roof or roof repair, so please, don’t hesitate to reach out! Deck: Roofing materials are applied to the deck, which is usually made from plywood or oriented strand board (OSB). Dormer: Dormers are small structures that project from a sloped roof. They usually have a window. Drip edge: The drip edge is attached to the edge of the roof. It channels water away from siding, eaves or the deck. Eave: The eave is a sloped roof’s horizontal lower edge. Fascia: The fascia is found at the cornice’s outer edge. It can be a flat board, band or face. Felt/underlayment: A secondary layer of protection for the roof deck is called the felt or underlayment. It is a sheet of tar paper, which is an asphalt-soaked paper. Fire rating: Roofing materials are rated according to their fire resistance. The three classes are A, B, and C. Class A is the most fire resistant. Flashing: Flashing is installed around intersections or projections including valleys, chimneys, vent pipes and joints on vertical walls. It prevents water seepage. Louvers: Louvers ventilate the area beneath a roof deck. They’re installed in a soffit or gable. They equalize air temperature and humidity. Penetrations: Anything that penetrates the roof deck, such as chimneys, stacks, pipes and vents. Rafters: The rafters are support framing to which a roof deck is attached. Sheathing: Sheathing is attached to the rafters to cover a building. Soffit: A soffit is the underside of the eaves. Square: One square equals 100 square feet (10 by 10 feet). A roof’s surface area is measured in squares. Valley: The intersection of two sloping roof surfaces. Vapor retarders: Vapor retarders restrict the passage of water vapor through a roof system or wall.